Blair McNamara is a painter, a photographer, a musician and a surfer. The ocean is his arena of meaning. 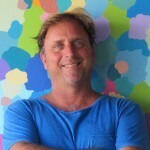 His art is highly respected and awarded as a unique translation of Australian beach culture. As a strong component of the Queensland visual arts scene, he skillfully and appropriately captures much of the cultural and environmental conundrums that have developed over the years in this vulnerable Sunshine Coast paradise. His unique ability to speak clearly and directly to a wide audience, not necessarily all conversant with the visual arts, enriches our community. As a visual artist, his career includes gallery paintings, local, international and touring exhibitions, residencies, public tutorials and numerous public art commissions. Many of Blair’s most significant paintings, photographs and murals are in corporate, private and public collections. Blair McNamara was an accomplished artist and draftsman as soon as he could hold a pencil. He showed me recently, a river scene work he painted of a man fishing near a jetty at Cotton Tree when he was barely a teenager. The work reminded me of the great European painter Vlaminck. He attended art school at the Seven Hills’ Queensland College of Art in the late 70’s and early 80’s under such luminaries as impressionist painter, John Rigby and expressionist painter Ian Smith. Here, pure artistic talent was embellished not only with various techniques but philosophically as well. He excelled in photography and artistry of different ways of painting and drawing. More importantly, he developed a framework for innovation – whether it be for abstraction, technique, presentation or realism. He is not just a ‘decorator’, but embraces cultural authenticity and comments on both the sense and spirituality of people and place. Whether it is his Arkleyesque townscapes, ethnic abstractions of seascapes, landscapes and sky-scapes. Some works are social and historical commentaries. Blair is an artist in the true sense of the word as he records events in nature and human settlement often embracing the interaction of both. He has exhibited interstate as well as in Hong Kong, the United States, Europe and South America. Other creative endeavours include playing music and story-telling and he has a deep understanding of, and values for, historical built fabric… particularly memories such as the ephemeral Somers’ Family Fare Store which was engrained in all of our minds and formed part of the ocean and surf culture in the 70’s and 80’s. His works such as the interior views of the bohemian café, ‘Cocos’ at the gates of Noosa National Park, are great records of a culture that laid a basis for a Sunshine Coast that has developed a distinguished point of difference to other destinations along the east Australian seaboard. Some works make references to indigenous cultures from Australia, the Archipelago and various Pacific countries. Blair is a true Antipodean artist and we are all blessed he has chosen this place to live and work. We are lucky that he grew up in a family in a wonderful, yet simple architectural environment that gave him integrity and passion. 2015 “Aqualinea”, Patio, Noosaville & Bundall, Gold Coast, Qld. – “Oceanica”, Patio, Noosaville, Qld. – “Fibro Coast”: Gold Coast City Gallery 15 Feb – 23, USC Gallery 12 June – 16 August, Qld. 2013 Ten Mile Beach Holiday Studio, Coolum Beach, Qld. 2012 Kart Space Gallery, Peregian Beach, Qld. 2009 “Surf Skate Punk” Beachouse Gallery, Kingscliffe, N.S.W. 2005 “Coodabin/Shoodabin”, USC Gallery, Qld. 2002 “Emocean”, CoolArt Gallery, Coolum, Qld. 2003 “Recent Works”, Fox Gallery, Brisbane City, Qld. 1998 “South American Works”, CoolArt, Coolum Beach, Qld. 1996 “Seascapes” Noosa Sheraton, Noosa, Qld. 1995 “Aqueous”, Noosa Regional Gallery, Tewantin, Qld. 1994 “Outside the Blue & White Flags”, Buderim House Gallery, Buderim, Qld. 1992 Coco’s, Noosa National Park, Noosaville, Qld. 1991 Gold Coast Fine Arts, Bundall, Gold Coast City, Qld. 1990 Michael Milburn Gallery, New Farm, Brisbane, Qld. 1988 Katz Wizka, Coolum Beach, Qld. 1985 Cintra Galleries, Milton, Brisbane, Qld. Ten Mile Beach Gallery, Coolum, Qld. University Sunshine Coast Art Gallery, Qld. Art Collections, Surfers Paradise, Qld. Buderim House Gallery, Buderim, Qld. Gold Coast Fine Arts, Bundall, Qld. Coco’s, Noosa National Park, Qld. Michael Milburn Gallery, Brisbane, Qld. 2013 Sunshine Coast Architecture Awards, M.C. 2008 Sunshine Coast Environment Awards, M.C. 2007 Australasian-Pacific Urban Planning Conference, U.S.C. Social Sciences Dept. – War Widows Guild, Maroochy R.S.L. – Maroochy Legacy Sub Branch, Maroochy R.S.L. 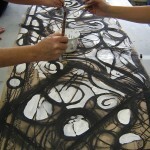 Unique in and outdoor art workshops that provide a range of hands-on art activities for art festivals, conference groups, holiday resorts, educational facilities and retirees. Paintings may be commissioned. As the collector, enjoy the opportunity to communicate your favorite themes, genres or styles of my art for your space. The final concept is arrived at through a creative process of negotiation and I reserve the right to decline a proposal. A deposit of 40% is required on commission’s commencement and balance due on completion. Freight of completed artwork to anywhere world-wide is incurred by the consigner. I enjoy community development and welcome you or your committee to involve me as a creative consultant to deliver artistic vision to your project or event. For three decades I have been a member of various community steering committees that generate public strategies and public art projects. I can identify and develop your next community project or event. ‘Urban-feng-shui’, your town’s entry statement, roadside treatments, parkland enhancements, sculptural playgrounds, public lighting, art exhibitions or your local festival must reflect what is great about your place. I continue to develop a colorful range of affiliations & friendships with other artists as well as gallery owners, arts organizations & educational facilities around the world. Associates, designers, fabricators and qualified tradesman are available to me as well as good access to studio/workshop space. Your university, school, public library, corporation, personal development group, retirement village, private institution, community group or festival may be especially interested in having me present a tutorial, art workshop or an electronic presentation of my work. In 2005, my timely coodabin/shoodabin (“Could Have Been, Should Have Been”) solo exhibition about the impacts of seachange on hometown Coolum Beach was staged at University of the Sunshine Coast Gallery. The exhibition drew record attendances and much media attention. Scholars of cultural mapping, urban planning, social studies, local history or Australian architecture may wish to include “Coodabin Shoodabin” into their forum discussion as a presentation.